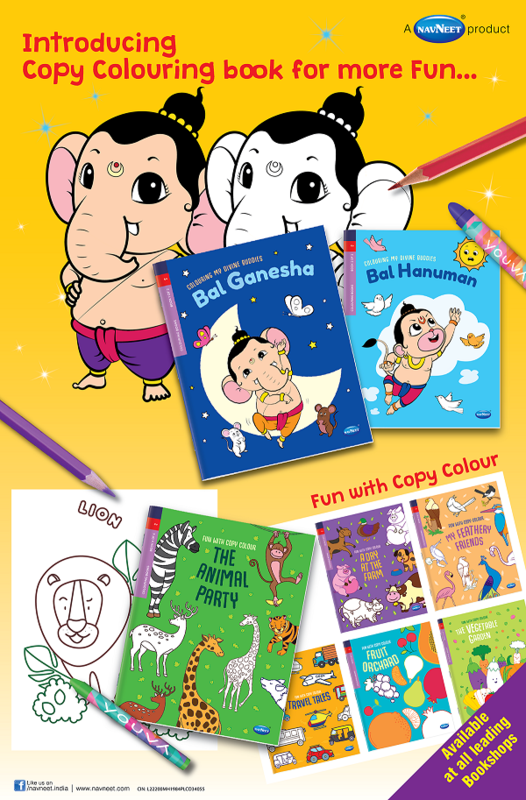 At Navneet Publications, we have introduced some really exciting colouring books for children. The ‘Colouring my divine buddies’ is a set of 2 books on Bal Ganesha and Bal Hanuman. This series is based on children’s favourite and friendly characters, which they would love colouring. Its unique combination of colourful and black & white illustrations will delight them like none other. ‘Fun with copy colour’ is another revised series as a set of 6 books from us at Navneet. The series includes ‘The Vegitable Garden’, ‘Fruit Orchard’, ‘My feathery friends’, ‘Travel Tales’, ‘The animal party’ and ‘A day at the farm’. Right from learning the names of the given subject while colouring, thick coloured lines to assist easy colouring, to increasing the children’s level with every progressive book, having smaller parts and more elements to colour, this series is filled with fun and learning.